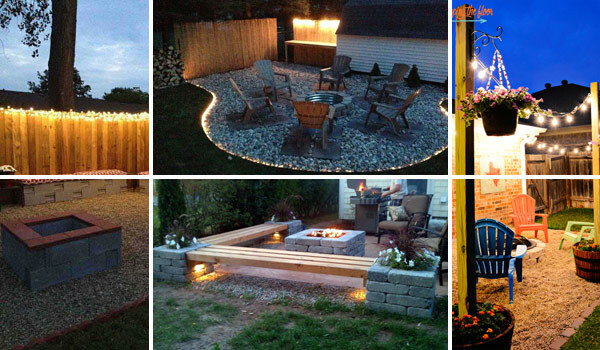 No need to bring the party indoors after the sun goes down, even if your yard isn’t lit. 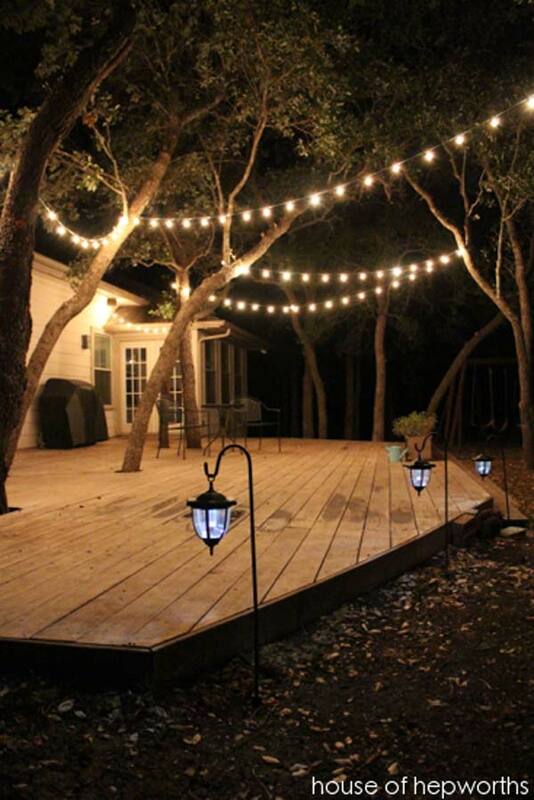 String up lights to illuminate the festivities. Don’t have a place to hang them? 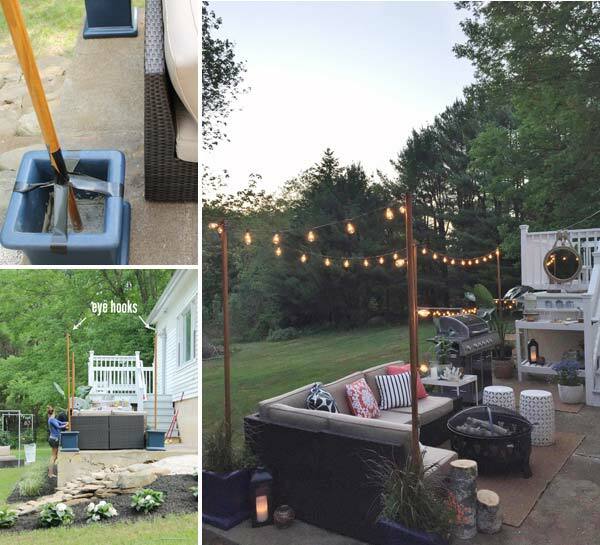 Wooden poles anchored in flower buckets filled with garden gravel can be set up anywhere there’s level ground, and they help define an outdoor gathering place. Bars and buffet tables must be adequately lighted, but they’re often located far from electrical outlets. An easy, inexpensive solution is to gather clear apothecary bottles and fill them with lamp oil and wicks. Arrange the bottles under a large hurricane for protection; we set these on a sturdy glass cake stand (make sure the bottles are evenly balanced on the stand). 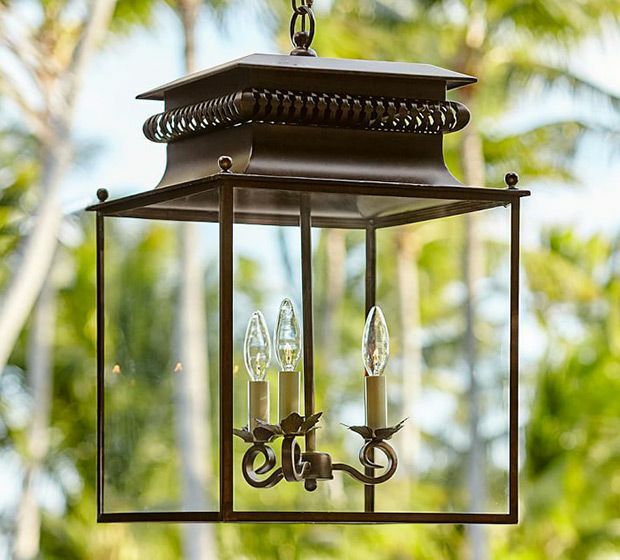 Pottery Barn’s ornate, bronzed-steel Bolton lantern is sure to take outdoor dinners up a notch. The table is lit with kerosene lanterns; easy to fill and light, lanterns provide the same shimmering glow as candles — but unlike candles, they won’t blow out. 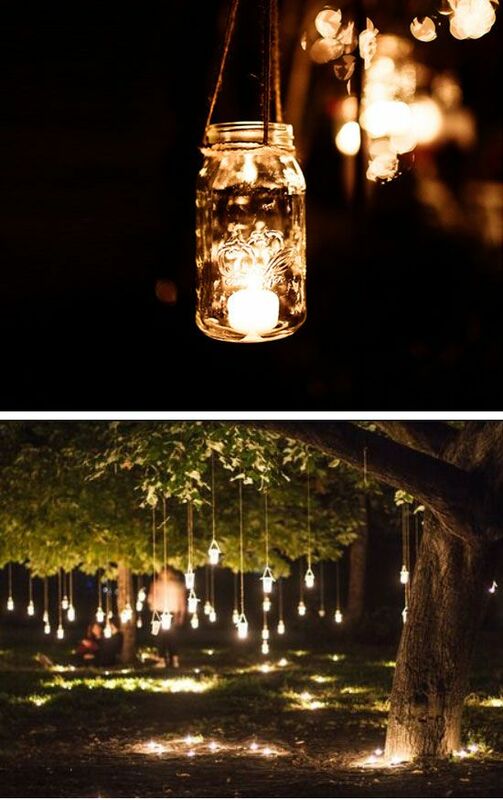 Lanterns can also be set down or hung by their handles at strategic points on the terrace or in the garden. 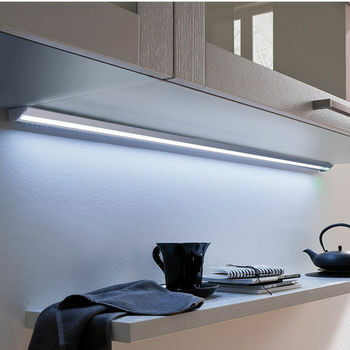 Flush-mount fixtures are another option for flooding dining areas with light. This aluminum and seeded-glass design from Sescolite has a fresh, nautical flavor. 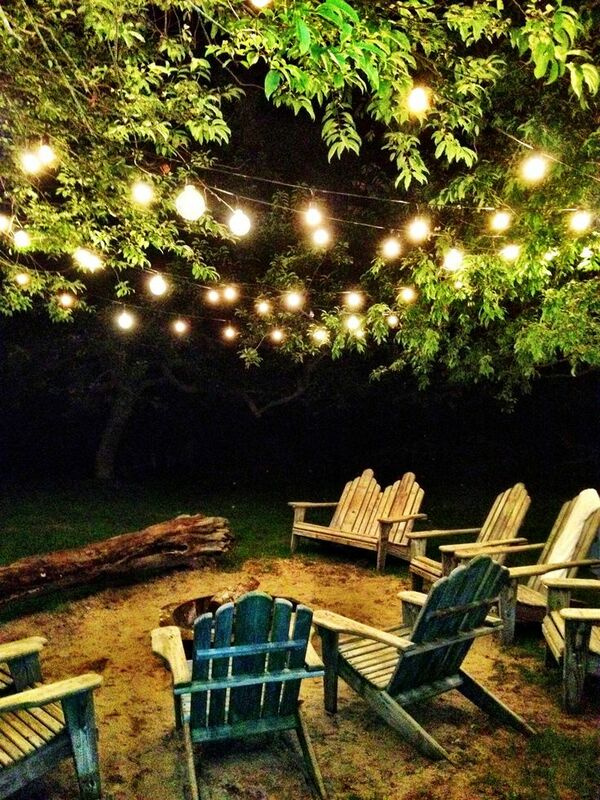 The grey-tinted shades on these string lights from Pottery Barn will diffuse light beautifully. For a romantic effect, I’d suspend a few of these shapely Canadian Tire pendants at varying heights. Your guests will love seeing their names in lights. These glowing place cards are votive holders wrapped in paper, inscribed on opposite sides. This way, others can read the names from across the table — helpful if people are meeting for the first time. Cut a piece of parchment to fit around a votive holder. With a ruler and pencil, mark two guides for the names, and then write them on with a felt-tip pen. Erase pencil marks. Wrap paper around votive, and secure with double-sided tape. Though they’re a decidedly more permanent option, you won’t regret installing outdoor sconces. They’re useful all year round, and add instant polish to an outdoor space. 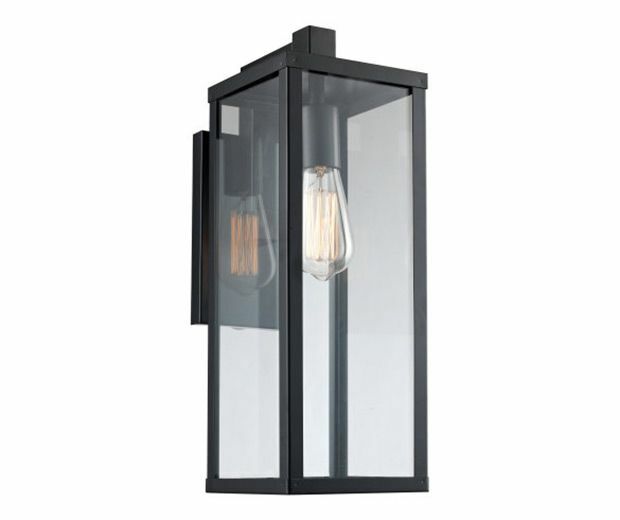 This lantern-style fixture from Union Lighting and Furnishings is especially handsome. Cast a warm glow from above. A midsummer night’s meal is served on the lawn under tall maple trees strung with lanterns hanging on chains from strong branches. Small and large, these lamps hold ivory tapers, their bases disappearing in a thick layer of fresh, fragrant rose petals. Reflected in the liquid’s shimmering surface, the flickers of a candle’s flame appear doubly radiant and twice as beautiful. Floating candles add instant atmosphere to a casual summer table, and with our technique, you can create lots of them in only a couple of hours. 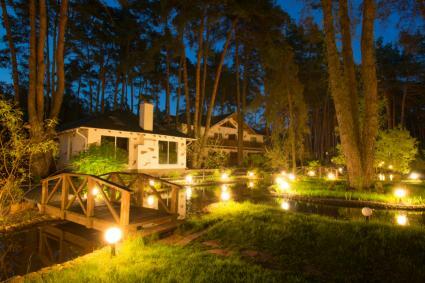 …or go for something more dramatic, like a marquee-style fixture. You can use oversize shells to bring a touch of the seashore — and a bit of romantic atmosphere — to an evening at home. We used “lion’s paw” shells (Lyropecten nodosus), available inexpensively from online auctions and souvenir shops. Fill a shallow tray with sand, arrange pairs of your prettiest specimens, and place a votive candle at the center of each pair (leaving room for the flames to flicker safely). Set the tray on a low table, and enjoy a quiet drink on the patio. 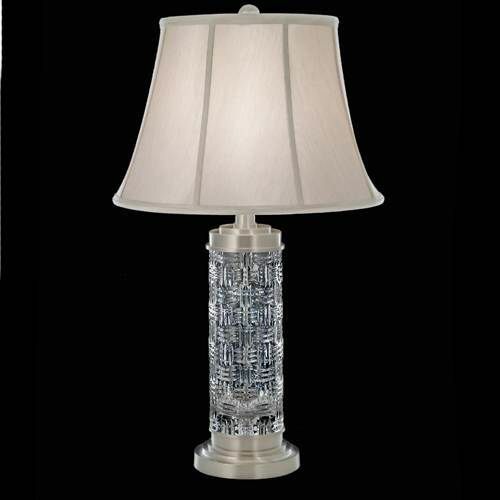 One of my top picks, Design Within Reach’s Luau lamp glows for up to 10 hours between charges. It’s also dimmable, thanks to a simple dial built into its base. These lanterns hanging from bamboo poles are origami “balloons” fashioned around battery-operated lights and finished with ribbons. These antique brass-finished sconces from Sescolite are perfect for traditionalists. I think sconces look beautiful flanking a doorway, or installed on the posts of a permanent structure like a pergola. A pair of these Baxter sconces from The Urban Electric Co. would make a particularly elegant statement. RH Restoration Hardware’s French farmhouse-inspired sconces have charm to spare. The shells that the ocean cast at your feet last summer — the ones you so fastidiously collected — make lovely remembrances of the season with candles formed inside them. Deep shells like scallops, clams, and quahogs work best and burn longest. 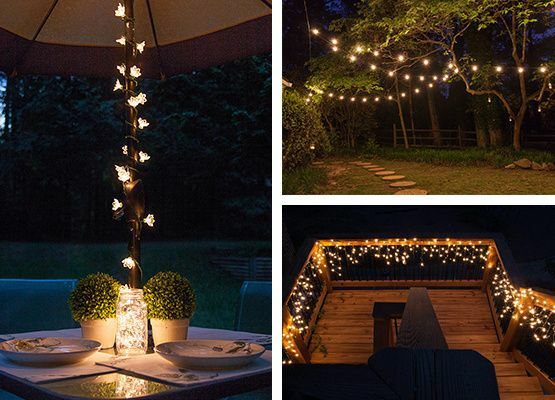 String lights have been popular for a few years now, and I don’t see them going away anytime soon! 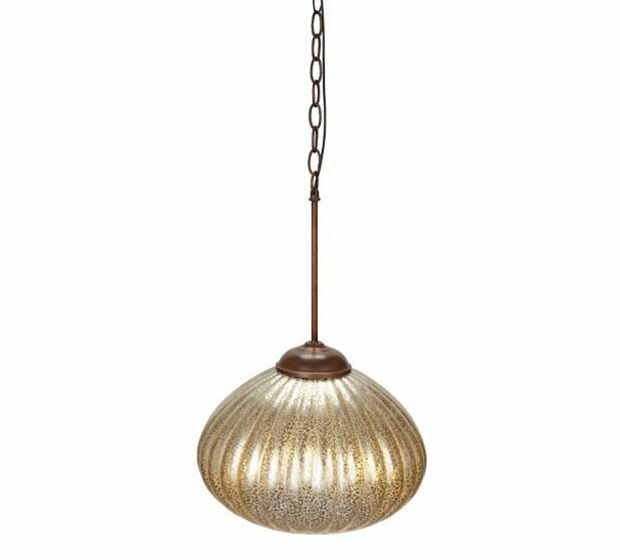 In addition to strings of simple, round bulbs, there are lots of modern, unusual and stylish options to choose from. These clean-lined Bullet Lamp lights from CB2 really stand out to me. 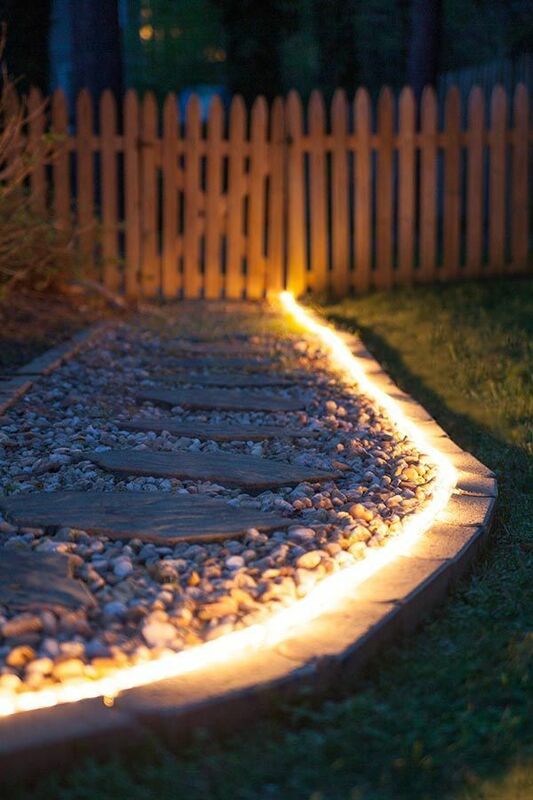 Lanterns — whether solar-powered, candlelit or battery-operated — are a great option for illuminating dark corners and small outdoor spaces. The Lexington outdoor lantern from Canadian Tire even comes with its own flameless candle. 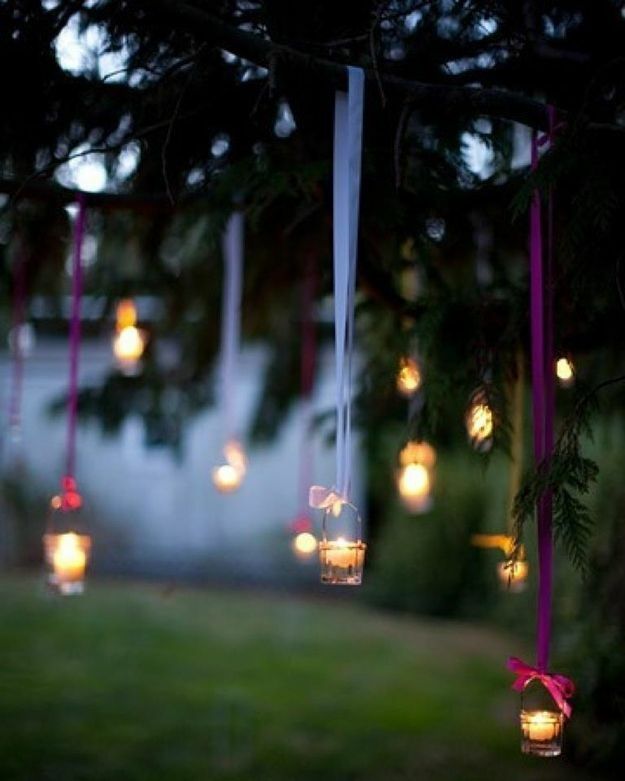 Colorful, pineapple-shaped string lights will bring a bit of whimsy to your yard. 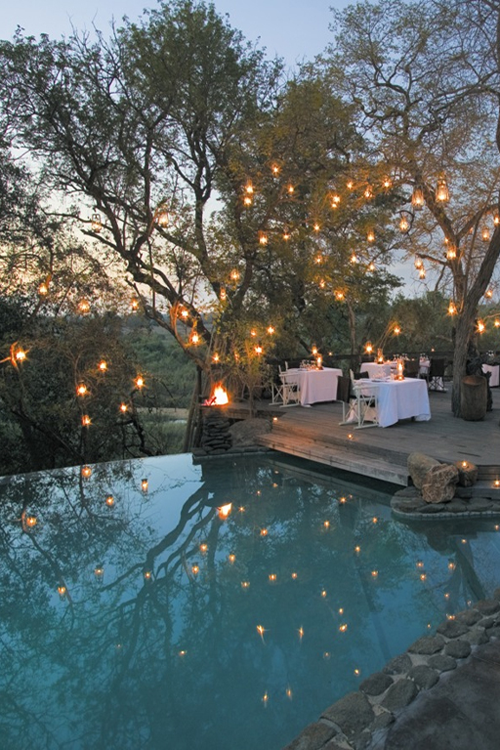 Under-the-umbrella lights are great for creating a soft glow over an outdoor dining table. For an understated look, hang these bare LED bulbs from Crate & Barrel. These flowers look like the prettiest climbing vines. But they’re not just sweet by day — they’re radiant by night. Despite their enchanted appearance, they are simply holiday lights covered with faux flowers (we chose flame-hued silk poppies). Bamboo candles, which have built-in shelves, are a pretty way to decorate the table the next time you’re entertaining outdoors. Geometric “topiaries” inspired by the paper sculptures of Isamu Noguchi stand on both sides of this swimming pool. A few white plastic beach balls tied to weighted lines float in the pool like pearls cut loose from a giant strand (for safety, never cover the surface of a pool with a large number of balls). This lantern from Bed, Bath & Beyond is solar-powered and super economical. If you’re throwing a party for someone’s anniversary or birthday, the guest of honor will shine with a set of photo frame lanterns. They consist of three hinged photo frames set around votive candles.